The Daily Randi: And Yet, One More Reason To Love Bookstores. And Yet, One More Reason To Love Bookstores. 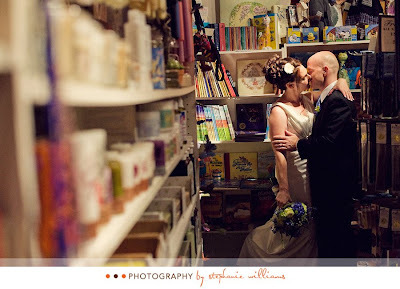 Our amazing Wedding Photographer, Stephanie Williams with Next Exit Photography, posted some pics on Her Blog last night! Isn't that Cute? If you like that picture, you can see more at Stephanie's Site. We can't wait to see The Rest! Some of the most beautiful wedding pictures I ahve ever seen. What a beautiful bride. Absolutely stunning! You looked so beautiful Randi. I LOVE the picture where you're in the chairs. Looks like you're hanging on for dear life! Maybe you could tell us the tradition behind that. I'd Google it, but I'd rather hear it from you. The tradition of lifting the couple up in chairs is a long one. It happens during the hora, which is the dance one does to Hava Nagila. I don't know its origins, but it is hundreds of years old. The Chair Picture is a Jewish Wedding Photo Cliche. Everyone has a picture from their bar mitzvah, bat mitzvah, and wedding of being lifted up in chairs and hanging on for dear life. Don't they got any Jews in West Virginia?! Aww, so beautiful! Those are really lovely pictures, and it looks like such a wonderful day. And your dress is STUNNING! Those have got to be the most amazing wedding pictures I've ever seen. Like something right out of a magazine. WOW! Why I'm surprised I don't know. I mean you're a great looking couple so of course you'd get amazing photos! Actually, I know a crap ton of Jews, used to work for a few. My Jewish boss got married but they had a private ceremony, without the hora and no chair lifting! Jews were the first major settlers of our region and for a city so small we have both a Synagogue and a Temple. We also have a mosque, large Catholic and Greek Orthodox congregations and a plethora of any other kind of church you would care to attend. However, I have not yet attended a bat or bar mitzvah, or a Jewish wedding. I, however, did hear all about my former boss's son's bris which I'd just as soon forget.